I tried to be a small purse person, I really did. But I love having a big purse. I can throw a diaper, wipes, snacks, and toys in this purse. My camera fits with no problem. I do lose my keys in this purse, but the benefits exceed the cons. I bought this purse because my black leather purse, the one I coveted for a year before I finally broke down and bought it, got wet in the stroller from a broken water bottle. The leather is all stretched out from trying to cram things into it. Someone at my church bought the exact same purse, and hers looks so new and unscuffed and pristine compared to my pathetic, limp, well-used purse. 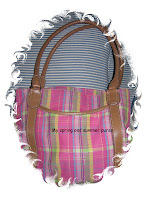 While I love this purse for spring and summer, I want to go buy one that’s more suitable for winter. You know, one that’s not so cheery and springy.